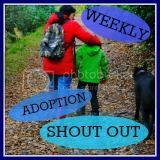 This week is National Adoption Week, as you may have realised by now. Many organisations are working together with individuals and families to promote adoption, and to raise awareness of the children who are waiting for their forever families. Bloggers are getting involved with this too, and a number of us are blogging and tweeting (#NAW2012) this week to help. At a time when (hopefully) more prospective adopters will come forward to enquire, it’s also important to look at the support that is available after a child is placed, and even further forward, after the child has been formally, officially adopted. After Adoption is launching it’s new campaign ‘Make Adoptions Last’. The national charity (which claims that 1 in 5 adoptions in Manchester breakdown) is calling for more support for families, and hopes to raise awareness of the difficulties that adoptive families face. Make Adoptions Last includes a fundraising campaign, and a short film featuring 2 adoptive parents who adopted sibling groups. Louise and Matthew both found the support from After Adoption invaluable. You can see them talking about their experiences at the Make Adoptions Last website. 98% of the families that After Adoption work with stay together, and they do this through family days, advice, information and parenting programmes, impressively they’ve helped over 115,000 people over the last 21 years. Many adopters, myself included, don’t realise what support is out there. I thought I was tied to my local authority (who assessed us and placed Mini) for support, and it’s been a long slow journey to get anywhere with that because they are understaffed, under financial strain, and they have to be specialists in all areas of adoption from assessing, to matching, to post adoption support. There’s also overlap with specialist agencies like CAMHS, and we’ve found that if you’re working with more than one agency, they like to pass the buck between them instead of one professional taking responsibility! It’s reassuring to know that there are national organisations out there whose goal is to support adoptive families, adopters and adopted children when they most need it – after adoption. And lastly, if you’re considering adoption, why not visit one of the charity’s Exploring Adoption events this week? More information here on the After Adoption website.